Fall is a transitional period and much of our time recently has been spent getting ready for winter. Today I’m going to share just quick overview of some of the things we have been up to. The driveway needed more gravel so my husband had 30 tons of 21 AA, also known as road gravel, delivered. 30 tons or 60,000 pounds doesn’t really look like a lot. It certainly didn’t cover our whole driveway but we were able to fix the bad spots. This job meant I got some tractor time as we worked together to get the stone spread. Another thing that my husband put a lot of time into is getting all of the equipment winterized and stored. Over the last few years we have acquired quite a collection of motorized equipment. The tractor, lawn mowers, rototillers, chainsaw, power washer and more, all requiring maintenance in various forms. My husband had mentioned several times that he needed to put together a Preventative Maintenance Schedule, he also referred to it as a PMS, and I laughed. When I saw him winterizing the equipment I decided to make him a preventative maintenance schedule. Even though my computer skills are not that good I was able to make him a chart that can be used as both a reference document and working document for all of the equipment. As a reference document we can record the name and #’s of each piece of equipment, as well as fuel requirements, spark plug numbers, and numbers of other parts that need to get replaced on a regular basis. With all of this information in one place he doesn’t have to pull out the manual for each piece of equipment to find this information. As a working document he can record the dates that any maintenance is preformed on the equipment. Here is a link for the PMS document that I made pms feel free to save it, print it, or change it, if you think it would be useful. Stocking firewood for the winter is another task that we, but mostly my husband, have been putting a lot of time and effort into. For us this involves cutting down trees, mostly dead ash, then removing the limbs from the tree, cutting it into approximately 18 inch logs that will fit into our fireplace, then splitting and stacking the logs. Since the trees that we are cutting are dead we have found that they don’t need to be seasoned. They are already dry enough to split and burn. One of the things that has always concerned me is watching my husband cut up logs with a chainsaw. First of all the bending is not good for his back, but mostly my concern is the way the logs tend to slip while they are in contact with the chainsaw. It just seems so dangerous. A while back I was reading an article in Countryside Magazine that talked about a sawbuck for holding the logs while they were being sawed. I had never heard of this before, so I did an internet search to see what I was missing. I came across this site http://www.firewood-for-life.com/sawbuck-plans.html that had complete plans, including a list of materials and detailed instructions, for making a sawbuck. It looked easy enough and quite affordable so I decided we were going to make one. I showed the plans to my husband and he agreed it was a good idea. He had a better idea. A few days later he showed up with a sawbuck. It was a different design from the one above, and it has definitely been used, but it meets his needs. Apparently when visiting a neighbor earlier this year he had noticed this piece of equipment. At my mention of his needing one he decided to inquire about the one he had spotted. When he asked the neighbor if he could rent or buy the sawbuck from him, the neighbor told him he could have it. 🙂 Sometimes all you have to do is ask. When I talk about firewood I always like to mention our log splitter. https://www.northerntool.com/shop/tools/product_200640136_200640136 I bought this log splitter several years ago when I wanted to be less dependent on my husband for splitting firewood. My husband had always used a maul to split the wood and had pretty much mastered the art. I, on the other hand, found using a maul a struggle. It took a lot of searching to find a log splitter that was not electric or gas powered and this is the only one that I came across. That’s why I like to tell people about it. Although it’s capabilities are limited to logs with a 6 1/2 inch diameter, it works for most of the logs we are trying to split. Cutting fire wood is something we will continue to do throughout the fall and probably into the winter. If you burn wood for heat, you can never have too much firewood. With record breaking high temperatures this week it’s been hard to think about the cold and snow that may be just around the corner. We have however we have been taking advantage of these days by getting things ready for the inevitable cold. Last week my husband cleaned and winterized the equipment we use, lawn mowers, the tractor, the four wheeler and such. He put plastic on the windows in the house, cleaned the chimney and tarred around any openings on the roof. This week his focus has been on remodeling the chicken coop and he finished that up on Wednesday. He also took time on Sunday to work with me on splitting and stacking the fire would that has been seasoning in our court yard. He used the maul for splitting, while I used our log splitter. 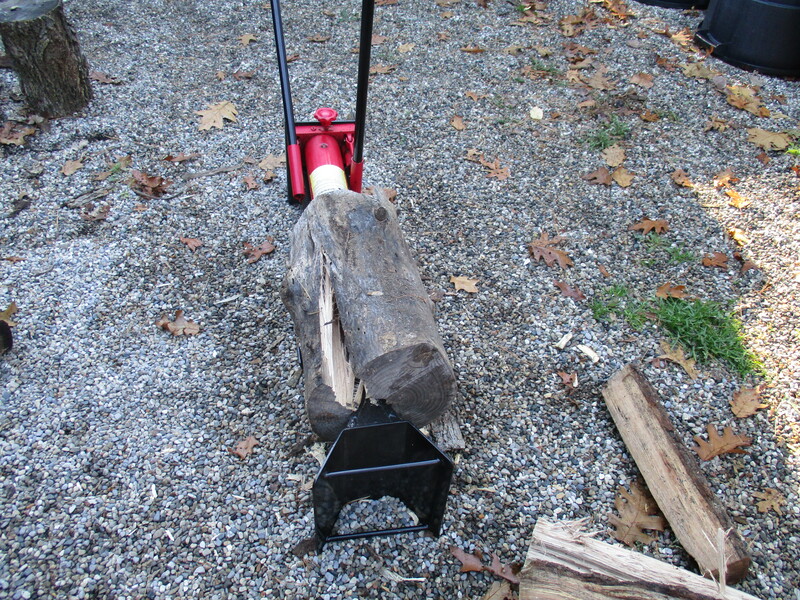 I love our little manual, hydraulic log splitter because it is easy to use, but I can still get a good work out. While my husband is really good at splitting wood with a maul, I don’t have the strength, the eye-hand coordination, or the scientific knowledge required to do this efficiently. On the other hand, using this log splitter requires less strength, basically no eye-hand coordination and while the scientific knowledge of how to split wood is helpful, it is not a requirement. I love the fact that I can get a good arm workout while being productive, and that it is not gas powered, and therefore it does not cost anything to run it. 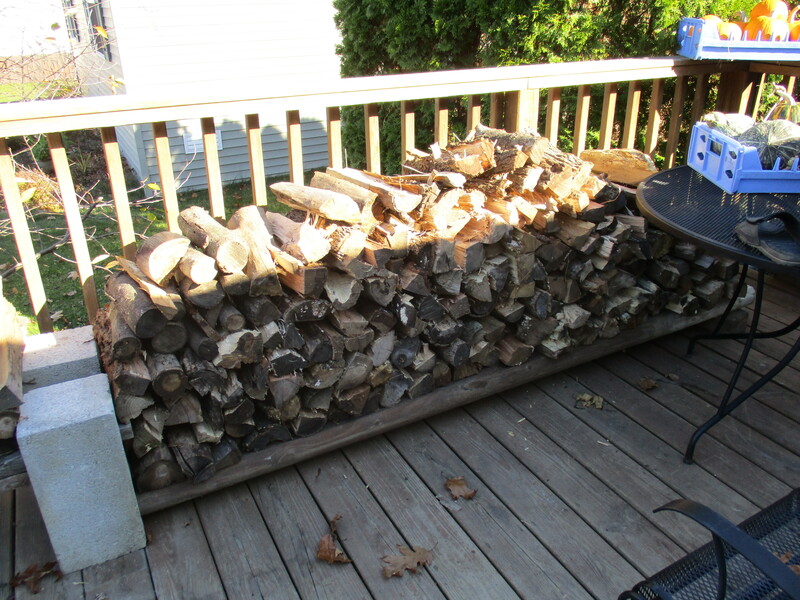 I finished splitting and stacking the wood on Wednesday. Thursday, as the summerlike weather continued, so did we. Getting done little jobs that in past years might have gone undone. Basically storing things that should be protected from snow and cold and pruning dead foliage from some perennial plants. 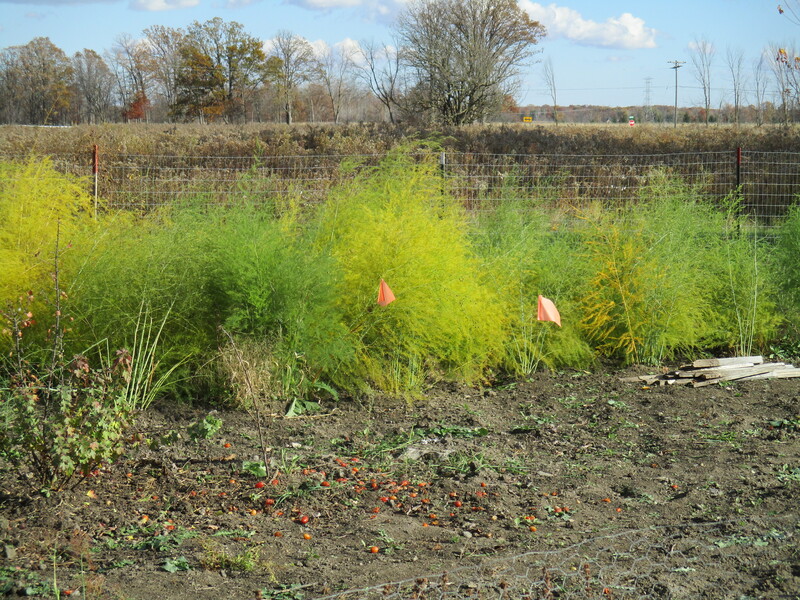 In the above photo, taken last week, the green and yellow feathery looking plants are asparagus. Yesterday I cut them all down since most of the top growth has died off, turning yellow or brown. As I did this I also pulled any weeds that were starting to grow up around the plant. It was a great day for playin’ in the dirt. I am certain there are many things that we will want to do before the snow flies and the ground freezes, and Lord willing we will have some decent weather for it, but this warm spell gave us great incentive to get a lot done.